Read here about tensegrity applications in outer space deployments, as used by NASA or designed by university-based teams. Such applications include pneumatically structured fuel tanks, self-deploying or foldable structures, and zero-gravity structural studies. For more general discussion space itself, see space. While tensegrity structures are not used per se in deployed technology, there are aspects of tensegrity structure in current state of the art rocketry. NASA "stainless steel balloon" tank technology is a pneumatic technology where the structural rigidity of the tank is provided solely by the pressure of the propellants within. It thus can be argued that the tanks are tensegrities; see pneumatics. 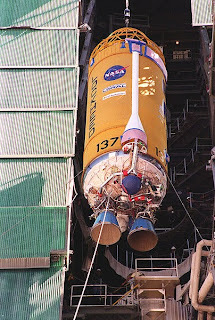 NASA's Centaur is a rocket stage designed for use as the upper stage of space launch vehicles. 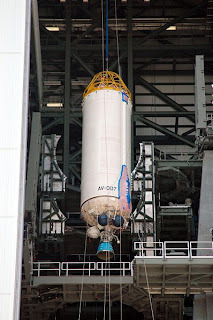 It is essentially a smaller version of the Atlas, that is, a lightweight "stainless steel balloon" tanks whose structural rigidity is provided solely by the pressure of the propellants within. 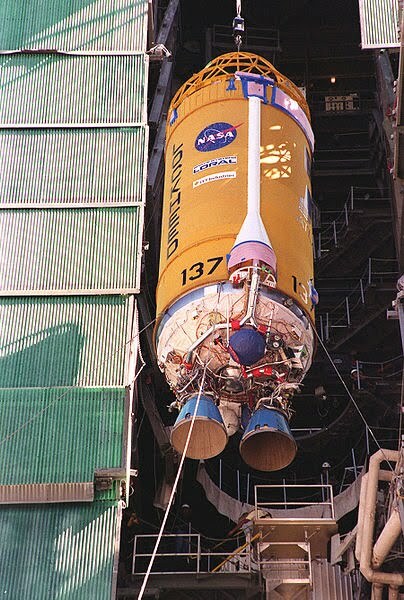 To keep the tanks from collapsing prior to propellant loading, they were either kept in "stretch" or pressurized with nitrogen gas. As such, these rockets are pneumatic structures, and so they qualify as being tensegrities. There is a growing literature on deployable tensegrities in space, such as "Concept of Inflatable Tensegrity for Large Space Structures" by Hiroshi Furuya, Makiko Nakahara†, Satoshi Murata‡, Daisuke Jodoi, Yuzuru Terada, and Keiki Takadamak from the Tokyo Institute of Technology, Yokohama, Kanagawa, Japan, presented at the 47th AIAA/ASME/ASCE/AHS/ASC Structures, Structural Dynamics, and Materials Conference held 1 - 4 May 2006 in Newport, Rhode Island, here. Tibert wrote a thesis dealing with the development of deployable structures, based on the tensegrity concept, for applications in space. A state-of-the-art review of deployable masts and reflector antennas for space applications is presented. A comparison is made between the various reflector antennas in terms of deployed and stowed sizes, mass and accuracy. The key step in the design of tensegrity structures is the form-finding analysis. Several methods proposed for this step are scrutinised and classified into two groups, kinematic and static methods, and the advantages and disadvantages of each method are investigated. Two of the statical methods seems to be identical. It is concluded that several form-finding methods are available, but no single method is suitable for general tensegrities. The force method, for the analysis of the kinematic and static properties of large bar frameworks, is presented. The analysis and design of deployable tensegrity masts, with three struts per stage, is described. A routine for the manufacturing of physical models is proposed and evaluated. Different schemes for deployment are investigated. A way to deploy the struts using self-deployable hinges is introduced and demonstrated by four- and eight-stage mast models. Finally, the tensegrity mast is compared with an existing deployable mast with respect to stiffness. The mast is relatively stiff in the axial direction but very weak in bending. The requirements for a deployable reflector antenna used on small satellites are formulated. A concept, which uses a triangulated cable network to approximate the reflecting surface, is adopted. The kinematically determinate triangulated cable network is thoroughly analysed. The achievable surface accuracy of the net, both to systematic errors arising from the triangular approximation of the surface and random manufacturing errors, is evaluated. The underlying principles and the statical and kinematical properties of the new concept are presented. A physical model is built to analyse the feasibility of the concept and to test various deployment schemes. The scheme using telescopic struts are identified as the most suitable and a preliminary design an antenna, with a diameter of three metres, for a future space mission is performed. Numerical computations show that the antenna is stiff and extremely light. This page was last edited on 18 January 2019, at 09:18.